Easy to install and designed to provide a secure fastening, these single expansion anchor zamac are well suited to use with a range of materials including concrete, stone, brick and similar hard materials. 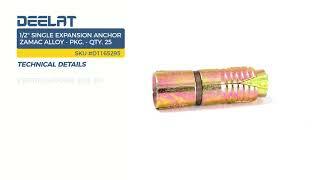 Each drive anchor features a strong and reliable alloy steel construction with a zinc finish. These fasteners can be secured into place quickly and easily with the use of just basic tools. There are included in this package, and each one has a size of 1/2".